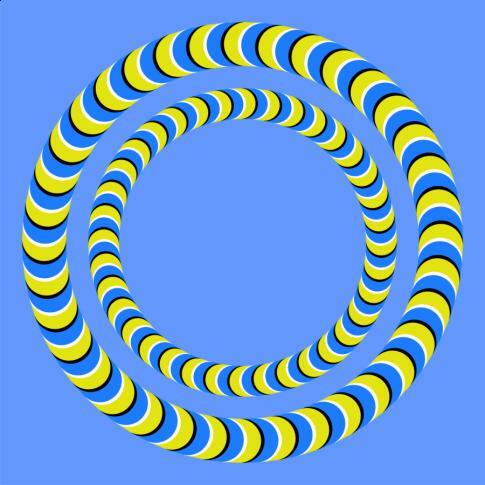 This is one of my favourites, the circles really do look like they're moving. lol I'm gettin' giddy lookin' at this! why do they look like they are moving? weird..
kate:really freaky but so cool!!! kelso:it freaks me out but still smart!!! these optical illusions are soooo sweet there the best ive seen yet!!!!!!!!!!!!!!!!!. amazing!!!!!!!!! i love this one!!!!!! it works! !i love this,esp MJ.. The black and white bands create the illusion of shadow, or depth, as your brain interprets it. The depth is impossible because the shadowed object, in this case, the bright colors, form a circle. Your brain tries to explain the apparent depth of a flat circle by assuming it's moving.